HTC will launch its first instalment of tablets in India by the end of this month. The tablet named HTC Flyer is a 7 inch tablet with aluminium uni-body construction (single piece of metal cast as full body) and will come with Android 2.4 (unfortunately not Honeycomb 3.0) operating system according to The Mobile Indian. The tablet is already available for online purchase at Letsbuy.com for a price of Rs.37,499 and a delivery time of around a week. 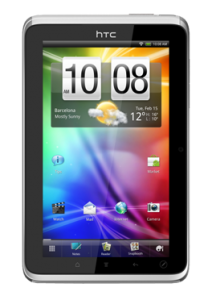 The tablet has a 7-inch (1024x600) TFT capacitive touch screen and is powered by a 1.5GHz Qualcomm Snapdragon processor. It has 1GB of RAM and an in-built memory of 16GB which is expandable with the help of a MicroSD card. The tablet will also have the new HTC sense user interface which has been specially redesigned for tablets. It has a 5 mega pixel camera at the back with high definition video recording capability and a 1.3 mega pixel camera on the front for video chat. It comes with a stylus for better writing on the screen and has A-GPS support for mapping. The battery can deliver up to 4 hours of continuous video playback. Apart from these features, HTC has also announced HTC Watch Service, a connected video service that will be launched with the tablet and will allow on-demand progressive downloading of high definition movies. The tablet can give output to larger screens because of an MHL port and DLNA capability and has Bluetooth 3.0 with A2DP for stereo headsets. It will support Flash 10 and HTML 5. HTC has also partnered with OnLive, and will launch the first cloud-based mobile gaming service on a tablet. HTC Flyer's competitors in India include Samsung's Galaxy Tab, Blackberry Playbook and the Apple iPad. While the Blackberry Playbook is a little costlier than HTC Flyer at Rs.38,500 , the Apple iPad (priced at Rs.29,500) and Samung's Galaxy Tab (priced at Rs.26,149) are much cheaper.